Archive for the ‘Read-Aloud Bible Stories’ Category. What does Modern-Day Manna for Preschoolers through Adults look like? Preschool Kalli was not being inattentive (as I had assumed) when she went running off while I was reading the story of “God Gives His People Bread to Eat” (Exodus 16:1-18, 31; Numbers 11:7-8) from Read-Aloud Bible Stories Volume 3. She came back with a basket and white paper and asked if we could make manna! I tore the white paper into strips and she and little Jake had a blast using safety scissors to cut bits of white paper into bite-sized manna. Then, we re-read the story and acted it out using our props! Quite a lot of time that week was spent with me strewing manna around the room for them to collect it in their baskets. They help us adults think beyond the ink on the paper and make the Bible stories come alive! “We like to get our manna a month supply at a time. God designed it that way. Wow! What a great reminder of why it’s important to spend time with God and His Word every day. This is wonderful wisdom to share with older kids and teens when helping them understand the importance of growing their own personal daily walk with the Lord! Our favorite Bible story books when my kids were preschoolers were the Read-Aloud Bible Stories, Volumes 1-4. (Link is for Volume 3, but will show the other volumes in the “Frequently bought together” section further down.) Something about the pictures and way the stories are written and simply enchanting to preschoolers. And, it’s not just my kiddos that love them. They’ve been a hit through the years as we’ve used them teaching our 2 and 3 year old Sunday School classes. Instead, this will have to do. Personally, I think this is hilarious. Hope it doesn’t offend anyone. They have lots of similar greeting cards, playing cards, posters, etc. if you enjoy their “where faith meets funny” themes. 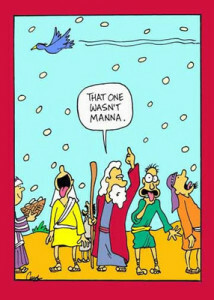 Have you and your kids had your “manna” for the day? handy for when teachable moments pop up! PS – I’m not if the company that makes these cartoons is still in business. The website seems to not be allowing for orders and the last FB post is from ’13.